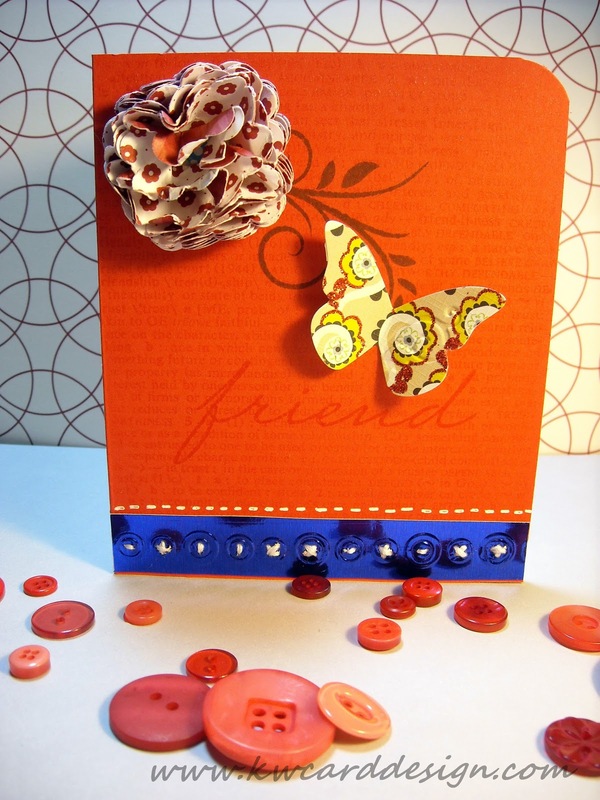 Hi crafters and blog readers!- I'm back late this evening with a new card share. I have a friend that is also my co- worker that is transferring dept. and I wanted to make her a card just to let her know that I will miss her, but I'm happy for her new venture. Like most of the cards I make- I make on a whim. Sometimes I have an idea, but most of the time I just randomly grab my paper, inks, and other supplies and see what comes of it. I like most of all the cards I make, but this one, feels some what different for me. Not sure why, but I like it!! I'm glad that we are half way in the week, and looking to the weekend. It is suppose to be warmer temps here. I hope so, for my hubby's sake. He has been wanting to play golf, and it is so much harder during the winter months. Anyway- back to my card- I kind got off track there, didn't I? So sorry- here is tonight's card. It was time to use some more scraps. I am trying so hard to use things that haven't been used yet, before I get into new paper. I have many die cuts, and other embellishments, not to mention a lot of scrap card stock that needs to be used. I am sure I am not telling you paper crafters anything new when it comes to scraps. The only thing new I used for this card is the embossing folder that looks like buttons at the bottom, other than that the butterfly and the handmade flower I have been meaning to use for a long while, but felt I didn't have a place for them, till now! Hope you all like this card as I do. I need to wrap up this post for tonight. I'm gonna get something to calm my sweet tooth and then head to bed. Night my friends! !